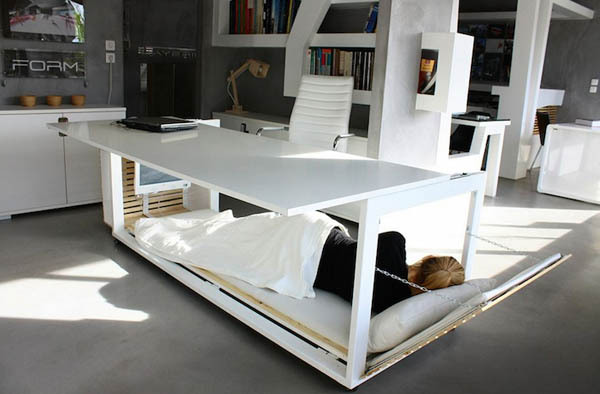 If you are one of those people who want to have a cozy napping in office, you got to this is ingenious desk designed by Studio NL’s. The Greece-based studio calls their design 1.6 S.M. 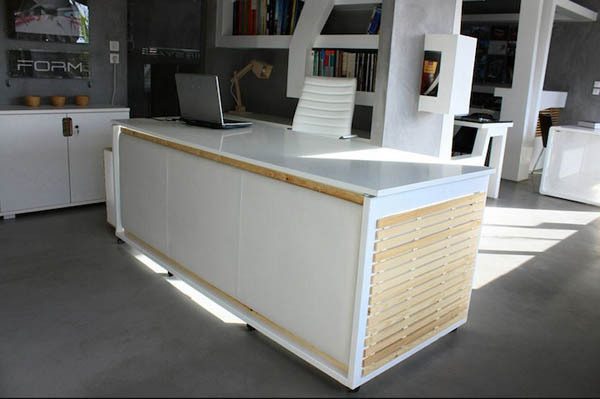 of Life based on its dimensions (two meters long and 0.8 meters wide) which offers ample desktop space for your computer and other supplies and a cushy nook underneath for a quick siesta or a few hours of sleep at night on those days when someone struggles to meet deadlines. To make sure user will have a comfortable napping experience, the underneath space is made as bed-like as possible. A white leather mattress lines the base, while one side panel opens at an angle and is perfect for a headrest. But even if you’re sleeping, the table can still be of use. Studio NL added a sliding mechanism to its desktop, which pushes the surface away from the bed and allows someone to sit and work at the same time, although it is a bit awkward. If you think the napping desk is a bit extreme, check OSTRICH PILLOW which allows you to have a comfortable napping on your desk.